Halo’s new line of stainless steel models are designed with the same enhanced features and benefits as the original line. 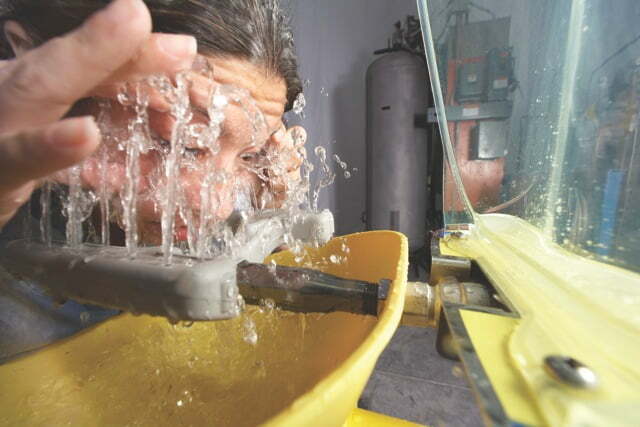 Using the latest technology in fluid dynamics, HALO covers 85 percent of the user’s face, which is more than 20 percent better protection than any other eye/face wash model on the market. With more coverage and a superior wash pattern, users attain the greatest contaminant relief and protection available. In addition to superior wash down capability, HALO incorporates an exclusive self-draining feature, which eliminates standing water left in the unit between uses and testing. The innovative self-draining Aquaduct™ design reduces the risk of bacteria growth when the unit is not in use. The integral strainer inside the Aquaduct further reduces debris in the water for additional eye protection and also prevents clogging. The strainer is easy to remove and clean during routine testing. HALO’s separate supply and waste pipes stand out as another exclusive product feature, meeting U.S. and European plumbing requirements. With separate supply and waste, potential for cross contamination is eliminated, again protecting the user. New and enhanced dust covers provide added protection and keep units clean and ready for emergency situations. When the cover is opened – using a new ergonomic hand-activation paddle that is easy to reach from any direction – water flow starts immediately, giving the user immediate relief. The dust cover’s clear translucent yellow design allows for easy inspection. New dust cover caps are hinged for secure hold. Bradley’s ground-breaking Halo eye/face wash is now available in stainless steel. Customers now have the flexibility to specify stainless steel safety fixtures suited for highly corrosive environments, while continuing to provide users the very best protection. The new stainless steel Halo eye/face wash line is ideal for caustic work settings and environments such as petrochemical plants, oil refineries or any harsh environment where hazardous chemicals are present. The stainless steel Halo eye/face wash system is electro-polished to remove fine abrasive particles from the surface for an added layer of corrosion-resistant protection. Bradley offers a large variety of preconfigured stainless steel models including wall-mount, pedestal and combination units. Barrier-free models are also available. And when even greater protection is needed, combination units can be specified in 316-stainless steel.